Seeking to avenge their 8-5 loss in Lexington in the first game of the series against No. 6 Kentucky (25-12), baseball came out with an 8-2 win. No. 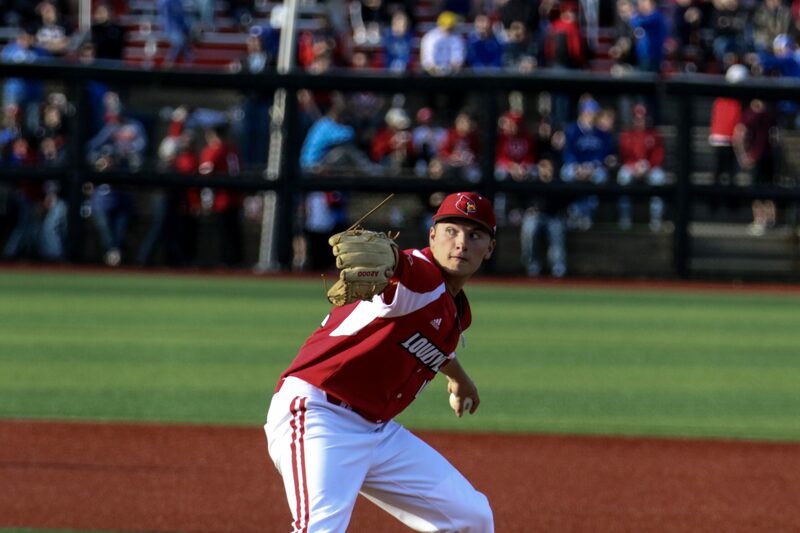 20 Louisville’s level of focus proved to be different in the second installment of the Battle of the Bluegrass, with all eight of the Cards’ runs coming with two outs. The offense used these hits to provide more than enough runs for the defense, plating eight runs on nine base hits. Starting pitcher freshman Reid Detmers appeared unphased against the sixth-ranked Cats. In his 11th appearance, Detmers threw for 4.2 innings, holding the Cats to just three hits and one run — a two-out solo home run by Kentucky’s Trey Dawson. After the game, McDonnell commented on the freshman pitcher’s performance. “He’s a super talented pitcher and the value of adding a fourth pitcher to this rotation is crucial,” McDonnell. Not to be outdone, the Cards’ bullpen (sophomores Shay Smiddy, Michael McAvene and freshman Gavin Sullivan) blanked the opposition, holding Kentucky hitless over 4.1 innings of relief, securing the win for Detmers. Junior Joshua Stowers provided the offensive spark in the fourth inning with an RBI-single scoring junior Devin Mann, followed by a two-out single by sophomore Danny Oriente, which pushed Louisville ahead 2-1. With 18 hits over the last 10 games, Oriente showed no signs of cooling off. The sophomore added on to his .338 batting average with a two-out RBI-double in the fifth inning , inflating the Cards’ lead to 6-1. Oriente The designated hitter finished the night going two-for-four from the plate with two RBIs. With the win, baseball moves to 25-11 on the season remains at 9-9 in ACC play. The Cards will now shift their focus to their next three-game series against Virginia, which will be played at Jim Patterson Stadium Apr. 20-22.